Since being in Berlin, I can't stop cutting lino (and my hands with it). I cut 2 months of a calendar (January and September) on 40cmx40cm pieces of lino with 7 other illustrators here. We printed it this fantastic print house called Bethanian. Artisits can go and print for the day or do 6 months apprenticing, there are lots of options. Anyway we printed 120 of these calendars, to have a look go to www.hammeraue.de. There was lot of exciting work going on here. All sorts of printing from off set to etching. So it is great to see that traditional printing processes are still around, as thet are slowly dying out. There are not just print workshops at Bethanian but sculpture and video etc etc. A big art house really in Kreuzberg. It used to be a hospital many years ago. Lino cutting seems to be having a bit of a come back. I have come across quite a few people here who use this in their work, ie Henning Wagenbreth they uses this very traditional medium but the yet it still looks contemporary. Look on his website to see more. www.wagenbreth.de. 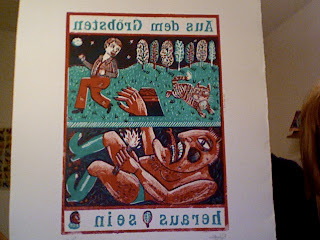 Linocutter to admire is most definitely Edward Bawden. Amazing skill, I never really realised untill I had cut my own. www.woodleapress.co.uk/ images/ebd4.gif one of his most spectacular cuts. Here is some more information about Die Tollen Helte, the books created by illustrators, written before in emilyhayes64 account. Deutsches Haus, New York University, 42 Washington Mews, March 1-April 30, 2003.
delight and also ensured that the viewer would not be overcome with sensory overload. contemporary movement in German illustration, this campus setting was quite fitting. able to stay at Deutsches Haus permanently.